Ah, with December comes those year-end, top 10 lists. 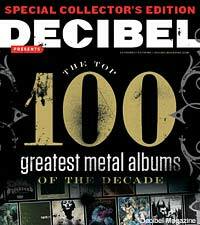 Decibel Magazine isn't just offering it's top 10 of '09. The magazine staff compiled its top 100 of the '00s! Seems like just yesterday we were all fearing the Y2K problem! Time flies, doesn't it? Decibel editor-in-chief Albert Mudrian wasn't so much worried about the online chatter, the 'How could they leave out such-and-such record?" and the general hatin' that would result once the list was published. Mudrian's biggest concern was much deeper! "My greatest fear in assembling Decibel's review of the '00s wasn't so much the debates, arguments and endless message board threads that would ensue upon our list's release into the wild," Mudrian said in his editorial note for the issue. "My biggest concern was that the extreme music recorded in the'00s couldn't match the power and glory of the ground breaking '80s or even the venerable '90s. Those of you reading this who were born during the Clinton administration, trust me, this is what old people actually worry about. Anyway, looking back on our list of these 100 indispensable recordings of the oughts. I'm not really sure what I was so worried about." The issue is available now at the magazine's Web store. Now that the issue is done and completed, the editor isn't too too worried about how it will be received. "Well, the thing about lists is that they are partly designed to spark debate," Mudrian told Noisecreep. "So, I certainly don't expect all metal fans to agree with our list. S---, I don't even expect all metal fans to agree that all the records on the list are even metal records! That said, more than anything, I feel like the list serves as an accurate snapshot of everything that really mattered in metal, and on the periphery of metal, in some cases, over the past 10 years." There weren't knock down, drag outs over the inclusion or exclusion of albums, either! "I actually didn't let our staff of freelance writers view each other's lists-that could have been extremely embarrassing for a number of folks," Mudrian said. "So, most of the debates occurred between me and Decibel's Managing Editor Andrew Bonazelli, who strongly protested the inclusion of System of a Down's 'Toxicity,' in additional to several other records, on the list. But since we ranked one of his personal favorites, Taint's 'The Ruin of Nová Roma,' just ahead of 'Toxicity,' I think he's managed to get over it." We see they've chose albums by Iron Maiden, Hatebreed, Pig Destroyer, among, 90-something others! Go forth and argue.